It’s been 20 years since the release of The Onion’s first book. 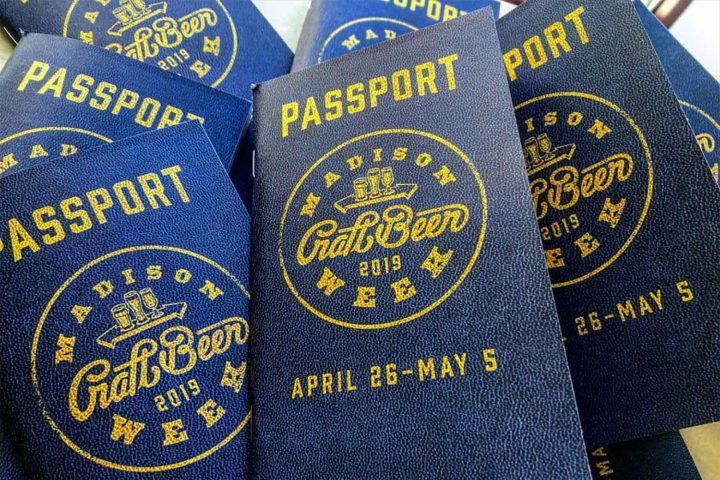 Our Dumb Century saw “America’s Finest News Source” look back at 100 years’ worth of American history via its own headlines, never mind the fact that the Madison-based satirical newspaper was born in 1988. Staffers worked basically non-stop for two years to assemble the book, writing and rewriting and rewriting. 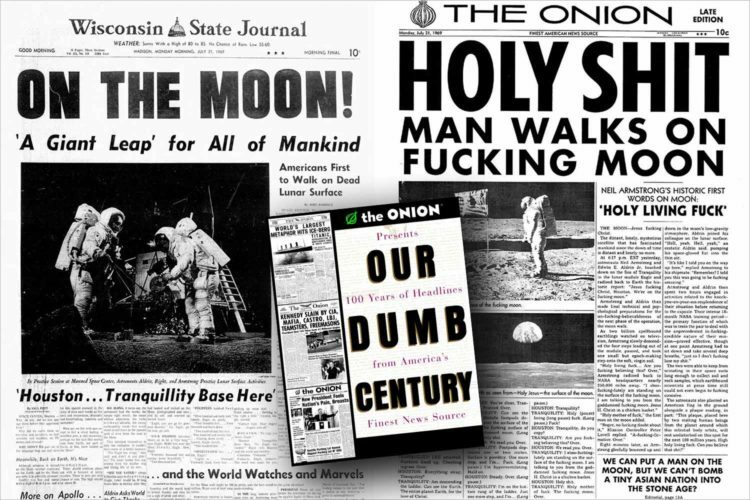 Anachronism and hindsight gave the The Onion’s acerbic wit an extra edge, while detailed typography and design put it over the top. And they did this all while still putting out their normal iteration of paper, week after week. Some of Our Dumb Century’s pages were pitch perfect parodies. 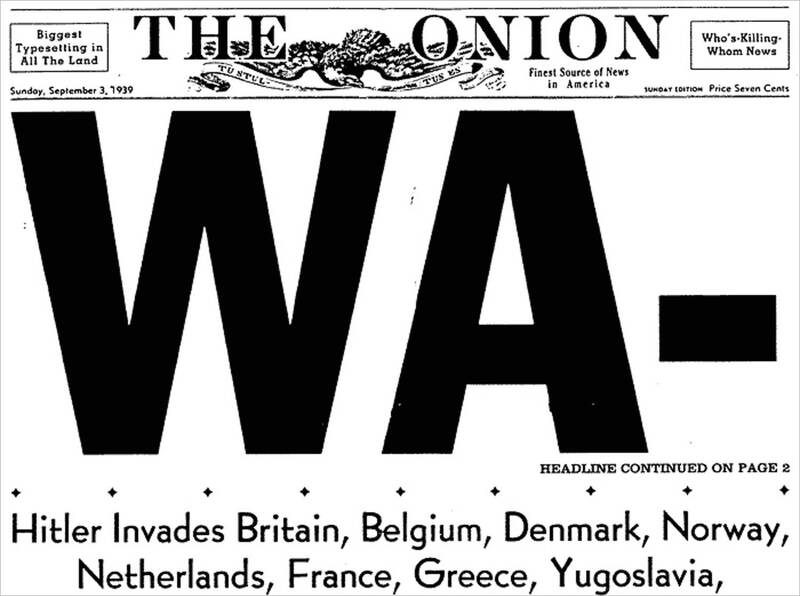 For example, their World War II proclamation — the Mulaney-esque “WA- (headline continued on page 2)” — is a sendup of a very real Honolulu Star-Bulletin extra from Dec. 7, 1941. And if you were really looking, there are great easter eggs throughout the book. One is a fictional company called “Global Tetrahedron” that appears early on and keeps popping up over the next 100 years, eventually becoming a sinister conglomerate. Our Dumb Century was originally slated for release by Disney imprint Hyperion Books. However, the Mouse pulled out after realizing not just the book’s adult subject matter, but also how mercilessly The Onion mocked them. (In one “report” from 1937, Walt Disney helps the Nazis appeal to children by designing a cuddly fascist mascot named “Kampfy.”) The ensuing publicity proved invaluable for The Onion. After the book entered literary free agency, not one or two but nine publishing houses battled for the rights. The book soon topped the New York Times best-seller list. 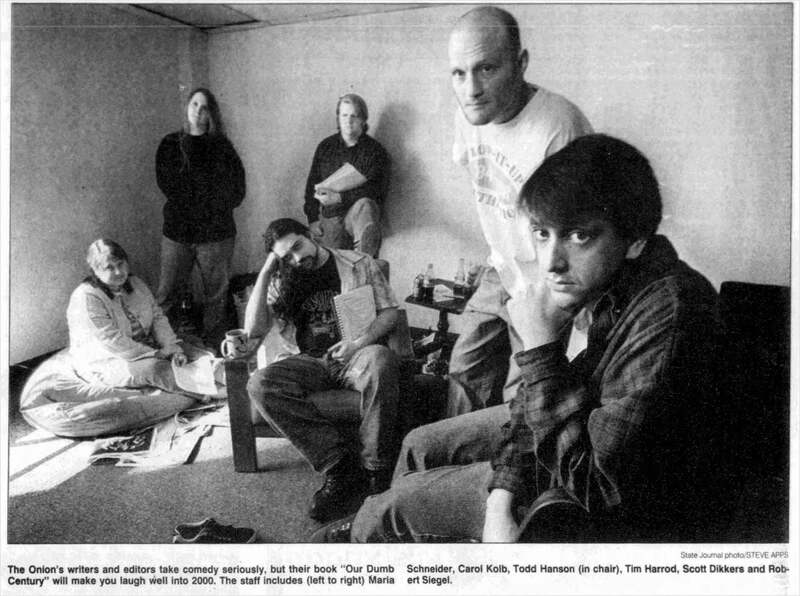 Near breathless praise further expanded The Onion’s audience, helping (along with its website, which launched in 1996) to bring it out of campus cult status and into comedy’s mainstream. Dikkers even appeared on Late Night with Conan O’Brien to promote the book — and circa 1999, Conan was the coolest voice in comedy. By 2001, The Onion had grown quite a bit. That year, the company said goodbye to its State Street office space and relocated to Manhattan. It remained in New York until 2012, when it moved into its current headquarters of Chicago. That’s where it was when the print edition ceased. July 20, 1925: Scopes Monkey Trial Raises Troubling Question: Is Science Being Taught in Our Schools? Dec. 6, 1933: 18th Amendment Repealed; Could Alcohol Cure Nation’s Depression? Oct. 17, 1980: Campaign ’80— Jimmy Carter: “Let’s Talk Better Mileage,” Ronald Reagan: “Kill the Bastards,” Which Message Will Resonate with Voters?